Wesabe | Wesabe: Your Money. Your Community. I am deeply unhappy to have to announce that Wesabe will be discontinuing our Accounts tab, and all of the related personal finance tools we offer, as of July 31st, 2010. The Groups tab, which hosts discussions on personal finance topics, will remain online indefinitely. A FAQ about this shutdown is available below. You will be able to download all of your data from now until July 31st by visiting our export page. After that date, we will delete all data and all credentials we hold for security and privacy reasons. If you prefer, you may delete your membership immediately or at any time before July 31st. We are planning to offer additional tools for export and use of your data. Future blog posts will go into more detail as we have it ready. In recent months Wesabe has been operating on a shoestring budget, with support from some of the developers and operations people who made up our core team. While the site has remained online and we continue to hear from people who find it helpful, we have not been able to provide the support people need to use it for something so central as financial management. I’ve felt especially terrible that some members have a good initial experience but then hit a problem, often after investing many hours, and aren’t able to get help with it. That’s obviously a bad experience, and not what we want to offer. Also, because Wesabe stores such highly sensitive data, continuing to operate the service with shoestring operations and security staff is not acceptable, and we do not want to continue accepting new accounts if we cannot guarantee the security level we believe our service requires. Wesabe Groups is easier to host on a low-cost basis, and one of our customers has agreed to fund its continued service. I have always been amazed by how fantastic the conversations in Groups are — supportive, constructive, and unique. While many or all of the features of our Accounts tab are now available on other sites, our competitors have either dismissed the value of community, or have not been able to create a community as rich as Wesabe Groups, so I’m very happy we are able to keep that part of the service going. I have had a wonderful time working on Wesabe and have been gratified by the many messages we get from members telling us how helpful it has been. The past five years have been an amazing ride. Of course I wish things had turned out differently and I would not have needed to write this post, but I’ve enjoyed my job for these years more than anything before it. The people we worked with, the people who supported us, the reward of helping even some people have better financial lives, all of that is irreplaceable. Thanks to everyone who has made Wesabe possible. We will answer as many questions as possible about the planned shutdown in this Groups thread and update the FAQ as needed. What is being shut down? On July 31st, 2010 (at 10pm Pacific time), we will turn off access to the Accounts and Dashboard tabs, as well as the iPhone application, Firefox extension, Desktop Uploader, Mac and Vista Desktop Widgets, and Twitter integration. Only the Groups tab will remain online. What will happen to my financial data? Between now and July 31st, if you want to keep a copy of the data you have uploaded to Wesabe, you MUST DOWNLOAD YOUR DATA from the site (see our export page for instructions). After July 31st, we will delete all financial data from our database, delete all backup copies of that data, and destroy the hard drives on which that data was stored. What will happen to my financial institution credentials? All users’ financial institution credentials will be deleted as of July 31st. Will you sell or give my financial data or credentials to anyone but me before you close the Accounts tab? No, absolutely not, nor have we ever done so. What can I do with the data I export? Any spreadsheet program, such as Excel, Google Spreadsheet, or Numbers, can read the CSV export files we offer. In addition, we are working on an added export option and an open source package that would allow you to read and use your own data from Wesabe. More details will be posted on our blog when available. What if I need help with my accounts before I download them? Realistically we are not able to offer individual support. If you have a problem with export, please post about it in this Groups thread, and we will work to fix any wide-spread problems. What if I have questions not answered here? Please post questions in this Groups thread. Wesabe’s network provider has an widespread network outage right now, and http://www.wesabe.com (and all our related services) are down as a result. We will provide updates via our @wesabe Twitter account as we get them, and we’ll update this post when the site is back up. UPDATE: The site is back up and our network provider confirms that the problem is resolved. Thanks for your patience. More and more web applications are storing sensitive data for their users, a trend of which Wesabe is certainly a part. Security breaches like the RockYou hack show what can happen when a popular web application stores sensitive data unencrypted and then has a lapse: millions of people can be affected at once. As some of the coverage of the attack pointed out, it was a good reminder not to store sensitive data unencrypted. Wesabe has worked hard to come up with tools to protect our members’ data, both because the nature of our application requires that we ask for extremely sensitive information, and because we believe that all web applications should take security seriously. Today we’re open sourcing a piece of software, Grendel, that we think can help many sites (not just financial applications) protect users’ data from a RockYou-style mass disclosure in a simple way. Grendel is a new project that combines ideas we’ve used on Wesabe for years with other pieces we believe should be common infrastructure for web applications. Nearly all web sites keep all of a user’s data unencrypted. In many cases this is a necessity, since the web site intentionally publishes that data; an encrypted blog wouldn’t have many readers. In other cases, though, the only time the data is used is when the user is logged in, such as in a word processing web application. The idea of Grendel is to provide an internal (behind-the-firewall) REST-based web service to keep a user’s data encrypted and ensure its integrity when the user isn’t using it. Grendel uses OpenPGP to store data, with the user’s password encrypting an OpenPGP keyset. That model makes it easy for a web site to store data safely and only decrypt it when the user is logged into the site. Since only the user has their password, once they log out, their data is safe, even if the web site’s database is compromised or stolen. Of course this isn’t an infallible protection — there is no such thing — and in particular it doesn’t protect against web site developers acting in bad faith. It does, though, protect against an attacker getting access to all the secrets stored by users in one step. Of course, data on web sites is usually shared with at least some other people in some way. Sometimes a user might want to share their information with the web site support staff, so the staff can help solve a problem or fix a bug. Or, the user might want to share their sensitive data with selected other users on the site, such as coworkers or family members. Grendel allows this, letting you encrypt data with multiple keys so that more than one user’s password can gain access. It’s very easy to screw up when building a cryptography system — check out Nate Lawson’s excellent Google Tech Talk on common crypto flaws, or Matasano’s Socratic dialog on similar topics, for a map of the pitfalls available to you, and us. We’ve been fortunate at Wesabe to have a number of people who think very carefully about security, and they’ve put a lot of effort into designing and building Grendel. That said, we have two goals in open sourcing Grendel: first, to make a tool available to others that could help make “cloud” applications in general much safer for everyone, and second, to open up what we’ve built so others can review and help us improve it. We would love comments on any aspect of Grendel, security or otherwise. Grendel is available on GitHub now, thanks to the efforts of Coda Hale (also the author of bcrypt-ruby) and Sam Quigley, who designed and built it. If you’re building a web site that stores sensitive data for users, go check it out, and if you’re of a mind to, help us make it better. We’d love to see “cloud” applications have an easy time treating users’ data securely, and we hope Grendel will be a useful tool for that purpose. I wanted to post a quick thank-you for the fantastic first-week reaction to our new site for banks and credit unions, GetSpringboard.com. I somehow expected that the Thanksgiving holiday in the U.S. would make the first week slow and easy. I was wrong! Wesabe is doing something that is unheard of in the financial industry. They are offering an online, consumer facing banking product that a FI can have up and running in HOURS. Think about that for a moment. Your FI’s CIO could go the Springboard website, select the plan she wants, break out the corporate credit card, and have an online PFM product running for their customers in a day or two at most. I don’t know of another banking tech vendor that offers implementation like this. No salesperson to haggle over features and pricing. No project manager to coordinate all the departments needed to make it happen. Just five minutes to fill out the registration form. Yup. That’s exactly what we’re doing. And the reaction has been amazing. Our guess that everyone likes convenience and low cost — even bankers — turns out to be spot on. 🙂 Thanks for the great write-up, George. As a reminder, we have a special offer for the rest of 2009: sign up for any plan and you get the price of the next lowest-priced plan for the life of your subscription. You can save up to $10,000 a year for as long as you use Wesabe Springboard, but only if you sign up before December 31st, 2009. Don’t miss it. We’re really happy with how many people have reacted — and acted — so enthusiastically to this new launch. Thank you. We’re working hard to make the site even better for you, your members, and all users of Wesabe services. 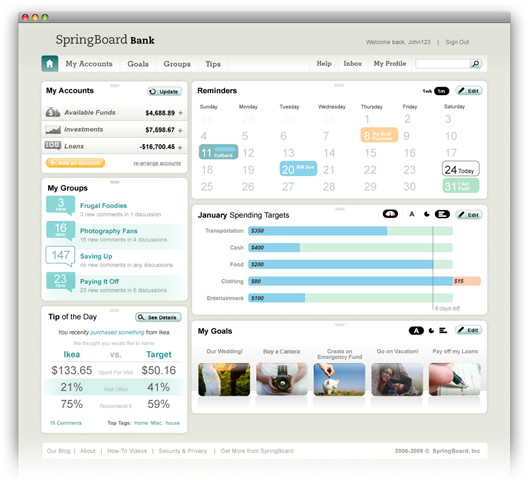 Today, Wesabe launched a new product line for banks and credit unions: GetSpringboard.com. Earlier this year, we started offering Wesabe tools to banks and credit unions, but this new product site allows financial institutions to get pricing, sign up, deploy, and configure their Wesabe Springboard site, all through the web. Instead of the traditional banking software sales process — where it can take months and tens of thousands of dollars just to get new software launched — GetSpringboard.com puts leading personal finance management (PFM) software into financial institution customers’ hands in minutes. Since Wesabe had its start as a consumer-based site, and since we have led the development of the online PFM space from that vantage, we know full well how tiring and time-consuming the enterprise banking software sales model can be. We wanted to give our bank and credit union customers all of the advantages we offer our consumer-site users, from easy setup and sign-in to full customization. The GetSpringboard.com site lets us do that. We’ve learned from our friends at 37signals.com and other online application companies, and we think their model is better. We wanted that for our customers, too. We’ve had a great response to Wesabe Springboard, and a great set of feedback to the GetSpringboard.com development. As one credit union executive put it, “We all grew up on the web, and we want to see our options and place our orders on the web for everything!” Bringing that model to banking software confronts some peoples’ expectations, but we believe, as that executive says, that everyone prefers ease and convenience. Even bankers! To introduce this new site, we’re offering introductory pricing for this year only. Sign up for any plan at GetSpringboard.com before December 31, 2009, and we’ll give it to you for the price of the next lower-priced plan for as long as you keep that plan. For instance, if you sign up for the Gold plan (normally $1799/month), we’ll give it to you for the price of the Standard plan (normally $999/month) indefinitely. You’ll save $800 a month for the life of your Springboard site. Note: if you decide to upgrade to a different plan later, you’ll lose your price break, so be sure to sign up for the level you think you’ll want to keep. We think this is a great deal and a fantastic incentive to sign up today. We hope you’ll check out GetSpringboard.com and let us know what you think. Hopefully your institution will soon offer Wesabe tools, so you have the best interface available straight from your bank or credit union. Three years ago today, November 17th, 2006, we launched the Wesabe site to the public for the first time. We were the first of what has become a wide and varied field of online personal finance applications. Our site has changed a ton since our launch, too, as we’ve learned from our users and the market. I was asked the other day whether I thought that online personal finance applications are now a “defined” market — that is, have the borders of the space been set and is all that is left figuring out who can get the most users. “Uh, no” was all I could think to say. Are consumers’ financial lives somehow solved? Is it somehow the case that people worry substantially less about money now than they did? Has our much-publicized space solved money in the way Google solved search or Amazon solved books? No, we haven’t. Neither Wesabe nor anyone else has made the personal finance app that we set out to build: one that makes people’s financial lives so easy that they no longer list money as their number one stress in life. There’s still so much more to do. Wesabe has spent the last six months solidifying and perfecting the core part of our app, and we’re happy with the results. We think we have a great app and a great basis for building more. But don’t think our fourth or fifth birthday will look like our third. We know all Wesabeans, and consumers everywhere, need far more, and we can’t wait to show you what the next year will bring. Thanks to everyone who has supported Wesabe for the past three years. The messages you post in Groups and on Twitter and send to our support line every day, telling us how Wesabe has helped you and made your lives better, are what bring us to work every day. They are more reward than any other we could ask for. Thank you. Wow, it has been quite a week. Over the past five days…. We changed our tagging system, which — since tags run everywhere in Wesabe — is a major change, both in amount of work and the impact on the site. This one caused some confusion, partially because people were accustomed to the old system, and partially due to some bugs in the first launch of the new system. We’re working out those bugs, and then I’ll post a whole guide to tagging, which will explain what we did and why we did it. Until then, please be assured that all of the capabilities you had (including split and one-time tags) are still there — we simplified the interface and gave you more control, even if it may not seem like it yet. Oof. We know that redesigns can be disorienting. Other people were unhappy about the lack of search and export, and others about the readability of text in the new design. Not to worry — to those who has expressed dismay at the changes or missing features, we have heard you, and we’ll fix those concerns. We may take a different approach than the old design did, but we’ll do it at least as well, if not much better. QIF import is already fixed, and the rest will follow shortly. A few people have asked why we removed features during the redesign. Sometimes it was because they just hadn’t been updated to the new design yet, or had bugs that were too severe, we felt, to ship. In other cases, though, we wanted to get rid of or revise features we didn’t think were working well enough, and pare down to the essential parts, the ones we know are neeed and work well. Was this the right decision? I absolutely still think it was — for instance, we removed Goals and Tips — two whole tabs out of four — and haven’t gotten a single complaint about either of them being gone. We do believe reducing the site to its essential features makes it easier to use for everyone, and we’ll add back the features people are actually missing. We’ll be happy, though, to keep out or substantially revise the features people didn’t like or haven’t missed. Overall, the reaction to the redesign has been completely incredible. So many people have said, “Now I can introduce this to my [less techinically savvy person]!” That’s what we were going for — getting Wesabe to more people without giving up any of the control or power we’ve always provided. Last but certainly not least, we announced our first Springboard customer, Delta Community Credit Union, the largest credit union in Georgia. We’re wonderfully happy to be working with them — they take helping their members extremely seriously, and have been excited about working with us, and we’re happy to be bring Wesabe services to a new group of people by working with them. We like working with people who share our values about helping consumers, and the credit union community, and Delta Community especially, line up perfectly with that. So, yeah. That’s a lot for five days. Thanks so much for all the great feedback and response, and for those of you looking forward to a fix or addition, no worries, we’ve heard you and will respond quickly. Follow @WesabeUpdates to get up-to-the-minute detail on new fixes and additions, and we’ll announce the big ones here. Thanks again! In November of 2006, we launched the Wesabe site after about two years of talking about it, figuring out what it was going to become, and then building it, one piece at a time. Wesabe was the first of what are now known as “Social Personal Finance” sites, and we didn’t have anything to guide us except the history of Quicken — from which we were explicitly trying to get away. Wesabe was new and the idea was new, and that meant we had to make it up as we went along. We spent a lot of the year leading up to Wesabe’s launch sitting in our cramped, informal office (in the back of a clothing store owned by my co-founder, Jason, and his wife) sketching, arguing, trying things out, and getting the pieces to fit together. With the graphic and UI design of the site, much of that process took place between me and Jeff, the site’s original designer, sitting in front of the gigantic monitor in his office. We essentially “pair programmed” the design, which helped me enormously as the product engineer, even if it sometimes frustrated Jeff’s better aesthetic instincts. Wesabe’s whole site has been completely redesigned — every page is different. Rather than having a developer-led UI, this is designer-led development, and we’re all extremely happy with the result. We hope you will be, too — and please do let us know what you think. When we first launched Wesabe back in 2006, we heard from strategists at nearly every large bank, all of whom were excited by what we were doing and talked about how long they’d been thinking of similar features for their sites. We quickly realized that many of the people calling us were looking at us as an experiment for things they’d long wanted to do — an experiment they perhaps wanted to observe from a safe distance in case it didn’t work. Fast forward to this fall. As the economic downturn and mortgage crisis developed, we started hearing from more financial institutions. The tone of the calls completely changed –- no longer were these fact-finding missions, but senior-level executives were telling us that they had watched our success and the growth of our space for the past couple of years, and now needed to help their members during these tough economic times. They saw how Wesabe was helping people with their money, how incredibly strong the Wesabe community is, and they wanted to know how they could work with us to bring those strengths to their sites — not as a long-term goal but as an immediate need. Even though the banks and credit unions who were getting in touch weren’t involved in the subprime mess, they were worried about being painted with the same broad brush as the failing institutions dominating headlines. Clearly, it was now a priority to shore up their existing customer relationships and attract some of the consumers who had seen their brand-name banks collapse overnight. Today, we’re officially launching Springboard, and hope that through partnerships with credit unions and banks, more and more people will be able to get more value for their money. This revenue model will let us continue to keep the existing Wesabe site free to all our members. And because Wesabe learns from every single person who joins –- be it how they tag or rate a merchant, what Cutbacks they choose or don’t choose, or how often they return to that new restaurant down the street –- we believe that expanding Wesabe’s reach will only serve to improve our community and our ability to help people achieve their financial goals. If you are a with a financial institution and would like to learn more about our services, you can read more here, or please drop us a line at springboard@wesabe.com. If there’s anything to be said of Wesabeans, it’s that they’re vocal. This is great since they ask questions, let us know what they want, and write their own documentation. What? Really? Incredible! Often we can’t (or don’t) write fast enough for the official documentation to cover everyone’s questions and needs. Enter Wesabepedia — user created and maintained documentation. Not only is it user created and maintained, it wasn’t even our idea — Wesabe users dreamt it up and put it together for the benefit of the community. Our new user manual should answer most questions about how we envision people using Wesabe, but Wesabepedia lets Wesabeans share “how to” notes on using the site in ways we never imagined — many of them far better than what we had planned. It’s for the users, by the users, on the topics the users want, and we couldn’t be happier. In appreciation for Wesabepedia and the people behind it, we’ve started linking to it in our “Community Resources” section under help. Explore and enjoy!